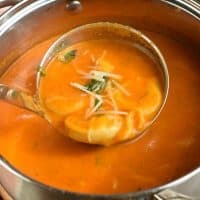 There are many foods that bring back the nostalgia of childhood, and tomato soup is certainly one of those foods. 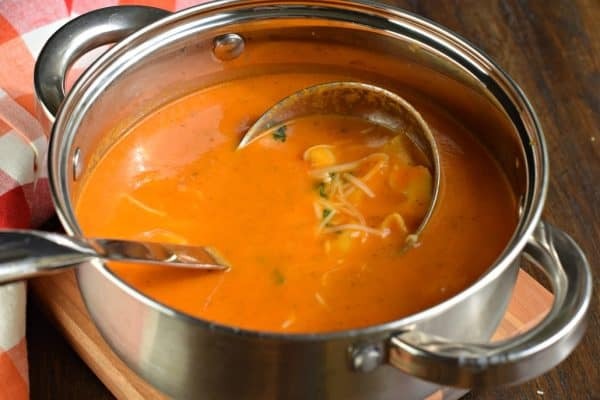 Making homemade tomato soup is easier than you think! Whether you choose to use canned tomatoes or fresh, I’ve got you covered with this flavorful meal! First start by roasting some fresh tomatoes. I use about 12 Roma tomatoes. To do this, peel and slice tomatoes (in half) and toss in a bowl with olive oil and fresh garlic. Roast with salt and pepper for about 45 minutes (in a 400 degree F oven). Remove from oven and put the contents into a large dutch oven (or soup pot). Using an immersion blender, puree until smooth. If you decide to use canned tomatoes, you can choose crushed tomatoes and skip the roasting steps. You’ll probably want about 2 large cans of crushed tomatoes. Next, add the oregano and vegetable broth. Simmer for about an hour, stirring occasionally. The final step is to add the fresh or frozen cheese tortellini to the soup pot. It takes a few minutes for them to heat and cook. Add the cream, parmesan cheese, and basil if desired. Serve and enjoy! Are you looking for a fluffy, delicious Dinner Roll? These No Knead Garlic Parmesan Dinner Rolls will please the whole family! This Italian Salad is loaded with fresh flavor and the homemade Italian Dressing is zesty and flavorful! The perfect pairing to your weeknight meal. 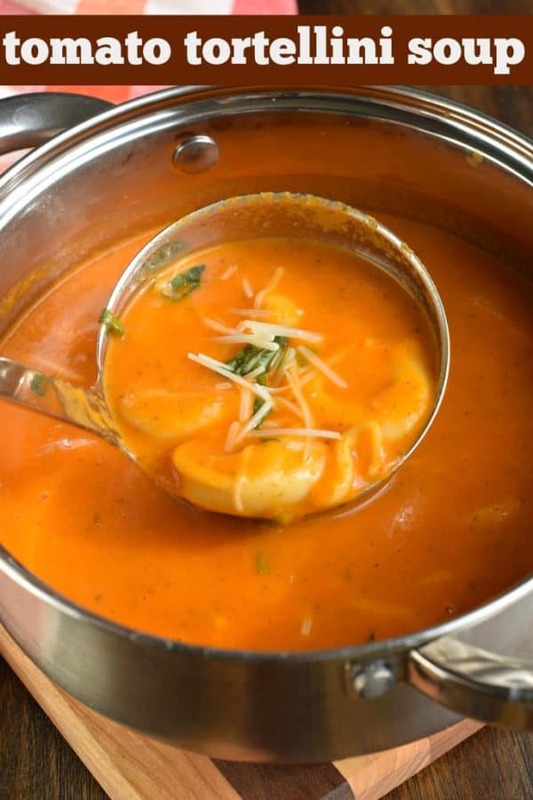 Delicious, homemade Roasted Tomato Tortellini Soup recipe. 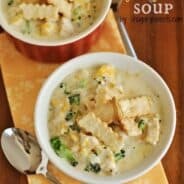 You'll love this restaurant quality soup that's full of flavor and easy to make! Add oregano and vegetable broth and heat over low heat, covered. Simmer for about one hour, stirring occasionally. Right before serving, add in cheese tortellini and allow to simmer for a couple of minutes. The tortellini will float on top when cooked (takes usually about 5 minutes or less). When ready to serve, drizzle heavy cream into bowl and top with parmesan cheese! ENJOY! 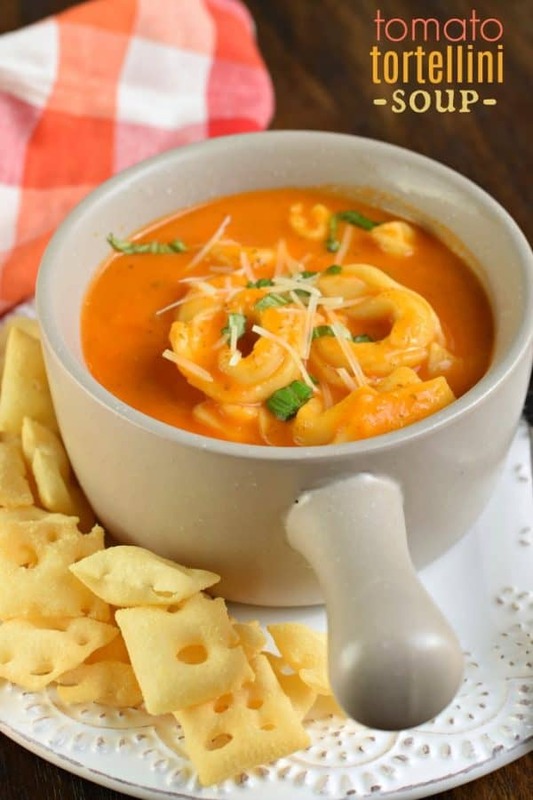 Tomato soup is so much better with tortellini’s in it! Can’t wait to have this for supper. 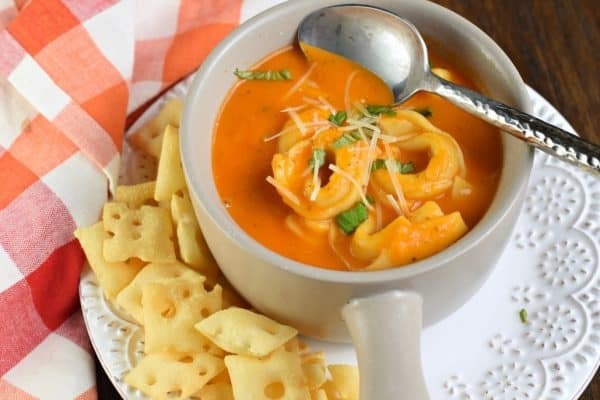 Love how the tortellini turns this soup into a full on meal without having to make a sandwich or something for the side! Fresh tomatoes really take this to another level. Will make again! I don’t have an oven at my place. Just a stove. Is it fine to make it on that? 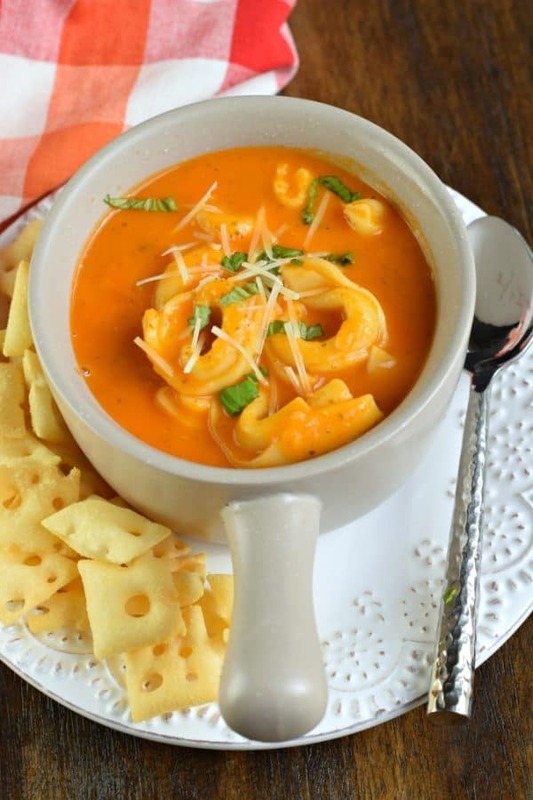 I absolutely love tortellini and never thought about having it in soup! Genius! Thank you! 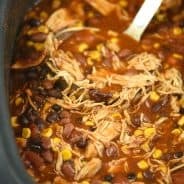 So easy and SO good, thanks for sharing this recipe! 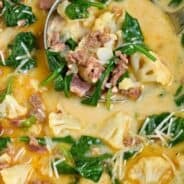 This one of those soups I keep coming back to because it’s so delicious and my kids adore it.